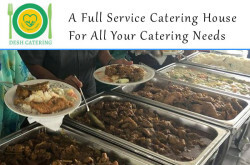 10 Hatkhola Road, Dhaka-1203, Bangladesh. 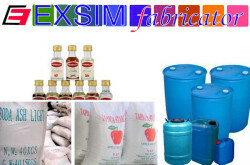 EXSIM fabricator is engaged in the field of Textile, Pharmaceuticals and Industrial Chemicals business in Bangladesh. Offers very competitive pricing with return goods facility to the Ready Made Garments, Jute and Pharmaceuticals businesses. Pharma chemicals – Minerals, Antibiotics, Hormone/Steroids, Excipents, Amoxicillin Th, Biotin, Boron, Chromic Chloride, Cloxacillin Sod., Cupric Sulphate , Diclofenac Soduum Tr Pellets, Ferrous Sulphate , Ferrous Sl + Zinc Sl + Folic Acid + Ascorbic Acid, Folic Acid, Flucloxacillin Sod Comp, Iron 111 Hydy Poly Comp. 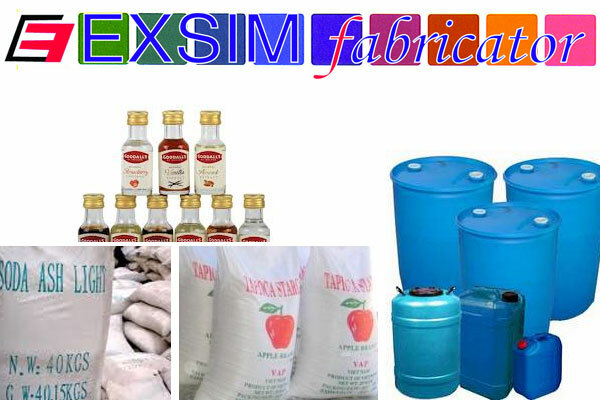 , Manganese Sulphate, Nickel Sulphate , Paracetamol, Pottassium Iodine, Potassium Chloride, Potassium Chloride, Trimethoprim, Zinc Sulphate Monohydrate, Banana Flavour Powder, Carnuba Wax, Cherry Cream Flabour, Citric Acid, Color Eurocert Red 2G , Color Eurolake Brilliant Blue F, Color Euro Lake Ponceu-4R, Color Iron Oxide Red, Color Quinoline Yellow D&C 10, Color Raspberry Red, Color Apple Green etc. Edta, Essence Lemon, Essence Orange, Essence Pineapple, Essence Raspberry, Essence Strawberry, Ethanol 95%, Eudragit L-100, Glycerin, Hpmc Methocel 100 Mck Mag. Stearate, Mannitol, Methylene Chloride, Mint Cream Flavour, Non Pareil Seeds, Opadry 11 White, Orange Flavour Powder, Peg-6000, Peppermint Flavour Powder, Raspberry Flavour Powder, Sodium Benzoate, Sodium Chloride, Sodium Cytrate, Sodium Cmc, Sodium Starch Glycollate, Sodium Saccharine, Sorbitol Soln 70%, Starch-1500, Starch Maize, Sweet Orange Oil, Talcum, Titanium Dioxide, Tween-80, Vanilla Flavour Powder, Vanillin etc. Vitamin A, Vit. B1-Thiamine Hcl, Vit.B2-Riboflavin, Riboflavin Sodium 5 Phosphate, Vitaminc C – Ascorbic Acid, Vitamin D, Vitamin E etc. Auxiliaries : Anticreasing Agent, Sequestering Agent, Stabilizer, Rsk (Soaping Agent), Per-Oxide Killer, Anti Foaming Agent Detergent, Fixing Agent, Silicon, Leveling Agent, Enzyme, Silicon Softener Etc. Basic : Apple Brand Starch, Soda Ash, Water Treatment Chemicals, Sodium Hydrosulfite 90% (Hydrose), Hydrogen Per Oxide 50%, Sodium Sulphate Anhydrous 99% (Glauber Salt), Soda Ash Light 99.2%, Caustic Soda Pearls/Flake 99%, Aluminium Sulphate (Alum) Etc. Dye : Reactive Dyes, Disperse Dyes And Cationic Dye. Industrial Chemicals – Apple Brand Tapioca Starch (Thailand), Ammonium Bicarbonate, Ammonium Chloride, Ascorbic Acid, Calcium Chloride, Castor Oil (Cg & Fsg) And Derivatives, Citric Acid, Cocoamide Propyl Betaine, Dextrose, Dicyandiamide, Edta Series, Esterquat, Ethanolamines, Fatty Alcohols, Formic Acid, Glycerine (Usp), Gum Arabic, Hydrogen Peroxide, Hydroxylamine Sulphate, Isopropanolamines, Isopropyl Alcohol, Labsa, Maleic Anhydride, Maltodextrine, Methylene Chloride, Monopropylene Glycol (Usp), Monosodium Glutamate (Crystal;Powder), Naphtalene Sulphonate, Nonyl Phenols, Peg-40 Hydrogenated Castor Oil, Phosphates, Phosphonates, Phosphoric Acid, Polyvinyl Alcohol, Potassium Hydroxide, Potassium Sorbate, Sodium Acid Pyrophosphate, Sodium Benzoate, Sodium Caseinate, Sodium Gluconate, Sodium Hexa Metaphosphate, Sodium Hydrosulphite, Sodium Hydroxide, Sodium Laureth Sulphate, Sodium Percarbonate, Sodium Tripolyphosphate, Sorbitol 70%, Soybean Lecithine, Stearic Acid *8 Sulfamic Acid, Sweeteners, Thiourea Dioxide, Titanium Dioxide, Tricalcium Phosphate, Vanillin, Xanthan Gum etc.